The prices stated here are applicable to fabrics that are currently in stock. These practical and fun pull-ups are designed to for little ones who are learning to use the potty/toilet. 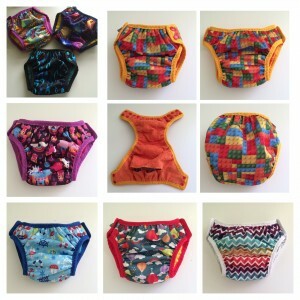 They are deliberately not as absorbent as a (reusable) nappy, unlike single use pull-ups which contain just as much wetness as a single use nappy, which doesn’t particularly help in the learning process. The idea is that these reusable pull-ups help contain a small accident if the potty can’t be reached in time, but are otherwise just like big kids’ pants to wear. Pulls up like pants, little ones can do it themselves. Side snaps allow easier, less messy access for the grown up in case of an accident. 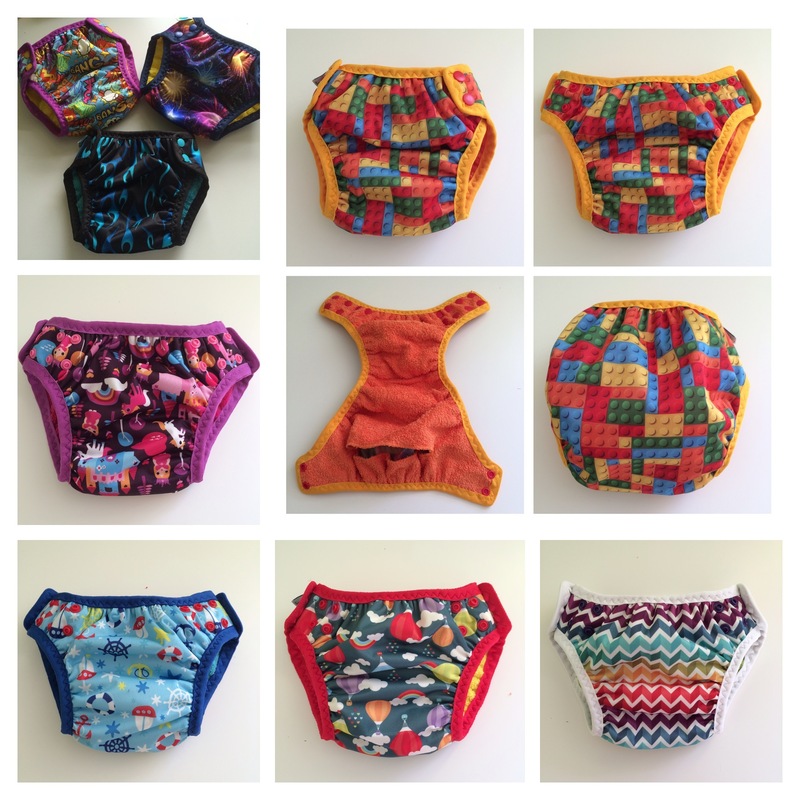 Elasticated waist and legs, plus adjustable size via the side snaps, mean they fit a large range of sizes, in case potty learning takes a while with one child, and they can be used with multiple children of different sizes. Lined with terry cotton, which feels wet next to the skin, helping them to realise when they’ve done a wee. Extra layer of bamboo fleece sewn into the wet zone, enough to hold a small accident (not a full large toddler wee). Outer made of PUL, which keeps wetness in like a nappy – available in bright block colours or fun prints that children will love. I have more designs and colours available to order than what is currently in stock: please get in touch for a custom order. Pocket opens at back of pants, which allows you to insert extra absorbency if required (I sell nappy boosters separately, or it fits other standard sized nappy boosters) – this can be useful at nap time, for example. This should fit most average sized children between about 15 months and 5 years (the rise will come higher up, like a nappy, on shorter children and lower, like brief style pants, on taller children). If you think that your child falls outside of this size range, please get in touch and I can make a custom size.